It has been a fairly boring week here. In St. Louis, it's been in the high 90's all week, so I've avoided leaving the house as much as possible. Luckily, I've had lots of time to hang out and watch movies for my Fashion and Film Friday Posts. 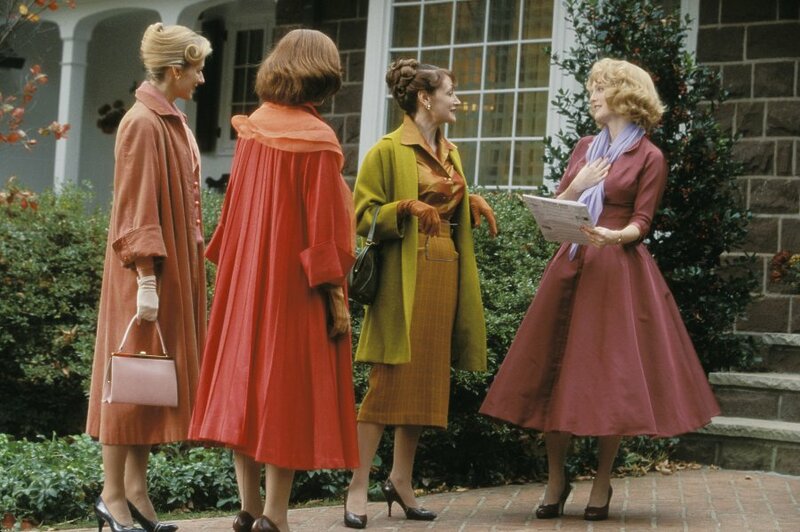 Far From Heaven is about a housewife, Cathy (Julianne Moore) who lives in a perfect, happy little 1950's world. She has beautiful children, a huge house, a successful husband and a very important social life full of cocktail parties and schmoozing. Her husband, Frank often works long hours at the office. One night, she takes it upon herself to bring him dinner at the office and interrupts him kissing another man and her whole world falls to pieces. 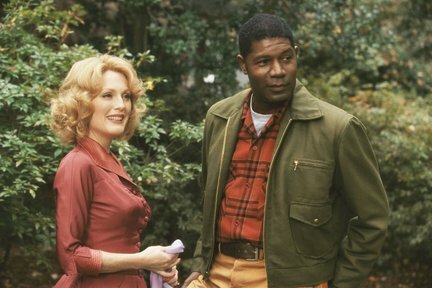 Cathy and Frank both struggle to keep up appearances while holding their marriage together, so Frank seeks help from a professional counselor and Cathy finds comfort in her African-American gardener, Raymond (played by the Allstate car insurance guy, Dennis Haysbert). Soon, Cathy and Raymond's casual conversation turn into a scandalous relationship that has both black and white communities talking. The lovely 1950s costumes for this movie were designed by fabulous historical costume designer, Sandy Powell. You may remember some of her work from Gangs of New York, The Aviator, Shakespeare in Love and Shutter Island. Vintage fashion lovers, be sure to look out for Ms. Powell's work in the up-coming films Sinatra, The Tempest and Hugo Cabret. 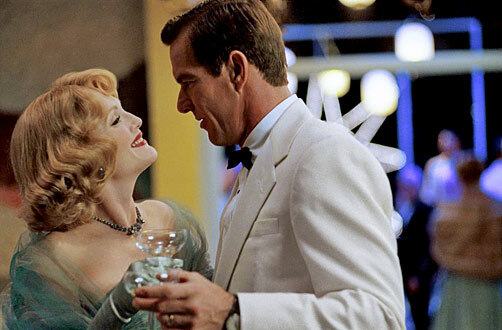 One of my favorite movies, no only for the fashion, but for the incredible interior design. yes, the sets are to die for!!! I absolutely ADORE this film. It's not my favourite Todd Haynes movie but I still love it. 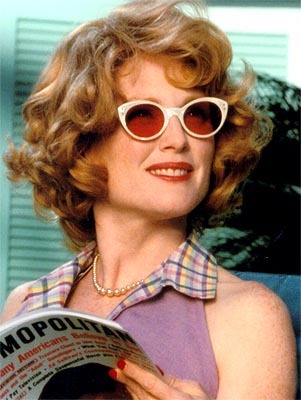 Julianne Moore is gorgeous and very talented. I like! I remember reading somewhere that the costume designer chose the colors specifically to compliment Julianne's red hair. Also, I think she was pregnant when they filmed this so they had to hide her belly under those full skirts!